Think of Janis Joplin and the first thing likely to come to mind is of a Jack Daniels guzzling blues-rock wailer with a big voice and a tragically short life. But an intimate new musical “One Night with Janis Joplin” seeks to deepen the understanding of this hippie-era rock icon via short confessional revelations she shares between songs in a concert setting that keeps the music coming. 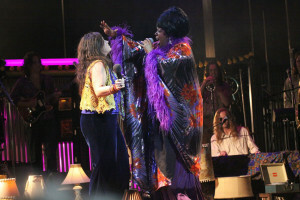 Off the bat it must be stated that Mary Bridget Davies brings Janis to life in bold vivid color. She sounds and looks just like her! 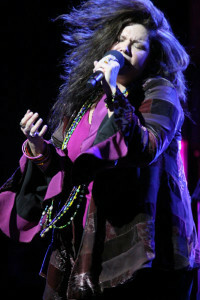 While her vocal approach is more precise and mannered than the rock star’s (most crucially hampering the climactic blues boiler “Ball and Chain” which requires liberal levels of abandon and anguish), she carries enough of the essence to deliver familiar gems like “Piece of My Heart,” “Cry Baby,” “Try (Just a Little Bit Harder)” and “Mercedes Benz,” and get standing ovations doing so on sheer bravado and passion. What the script does well is reveal through Janis’ connections to her musical muses her thoughts and philosophies about women vs. men, family, love and relationships, and unconditionally chasing “crazy” dreams. We learn about her healthy middle class upbringing, youthful introspection and the R&B/Blues goddesses that helped to shape and liberate her soul, her passion for reading, and her unsung skills for painting and art. But we don’t get any explicit insight into her emptiness and pain via specific scenarios. This is not a “play” where we watch Janis from childhood to death, rather a concert where she muses on life moments as spoken anecdotes. Imagine her living long enough to have one of those 3-hour “An Evening With” kinds of concerts where she lures her fans in closer with colorful stories accentuating the songs. In this sense, we learn more about what inspired her music but not enough about what haunted the woman. A wonderful surprise is that while Janis is the star and namesake of this production, it is a recurring character simply credited as “Blues Singer” (embodied by Sabrina Elayne Carten) that is consistently impressive, appearing at different junctures in the guise of Bessie Smith, Nina Simone, Etta James and – in a humorous duet with Ms. Joplin – “The Queen of Soul” Aretha Franklin! Blues Singer vocally and physically animates classic diva performances such as “Summertime” and “Nobody Knows You When You’re Down and Out” with stunning authenticity. Then in the second act, plunges the knife and twists it with the revealing medley “Kozmik Blues / I Shall Be Released.” Indeed, while the mission is stated upfront as to dispel misconceptions about Joplin perpetuated over the years, so much of Janis’ pain is left to the words of the songs she chose to sing to fill in the blanks about the dark side of her life than expository autobiography. 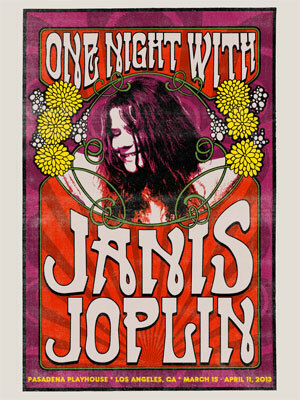 Ultimately, if one was either remiss or too young to experience Janis Joplin in concert before she died in October 1970, the performers, the set design, lighting and staging approximates the late `60s rock n’ roll concert experience a la Janis with respect and aplomb. Amidst the lava lamp lit backdrop are actually paintings of Janis’ that reveal a painfully expressive gift. The band – on stage throughout – is strong covering music from several different styles and eras beyond just the rock (which rocks). Even the aisle staff gets into the act all donning headbands and/or love beads. If this were a movie, it would be rated PG-13 for a little raw language. As a live experience, we give it a B for above average yet leaving one wanting to learn more, unleashing the truly nosey hounds to read her books and memoirs.